I know that people reading this review are going to wonder why it's coming so late, so I'm going to head things off at the pass by just admitting that I was way behind the times on Max Tundra and that I'm sorry. You needn't say, "I told you so," because I've already scolded myself with the phrase after hearing this album almost a year and a half after it actually came out. At the time it actually arrived back in 2000, it was one of those discs that I put on a list in my head, but never got around to it because it was only available at import prices. Being the cheapskate I was, it got pushed further and further into the background until I'd forgotten it. Now that I've heard Some Best Friend You Turned Out To Be, I wish I would have been a little more on top of things at the time. It's a quirky, mish-mash of styles and genres, but damn if it doesn't entertain nearly all the time. 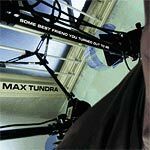 Reminded again of the Max Tundra name (seeing it on the Tigerbeat6 Inc Comp refreshed my memory), I hunted it down. Now that so much time has passed, main man Ben Jacobs is already nearly complete with another effort, which should arrive sometime this year. Starting out with one of the best album opening tracks that I've heard in a long time, "Cakes" sets a mood that is hard to duplicate. Although the track runs a very pop track length of 3 and a half minutes, it's literally hard to describe how many different changes the track goes through, as cheesy keyboard synths swell, guitar melodies flutter about, pre-programmed beats mingle with live ones, and ragged horns and sampled vocals fill in the rest of the gaps (along with about 50 other elements). It's like the sampled/electronic/lo-fi version of a turntablist track, but it's absolutely stunning and honestly got stuck in my head for days. With such a good track to lead off the disc, it's imaginable that things afterward don't measure up quite as well, but that's only partially true. After a somewhat wandering second track, the disc again picks up again with "Ah, There's Deek Now, Let's Ask Him" as layers of recorder play over an almost tribal pitter patter of beats and a wanky sounding bassline infects things. Just in case you didn't think things could get more eclectic, "Lausanne" adds kettle drums to the mix alongside buzzy synths and "Bill Sholem Quintette" starts out with an intro that sounds like a cheap Casio keyboard backing rhythm before sauntering into a weird math rock / minimal electronic hybrid. As if not to offend the electronic purists too much, "The Salaton" starts off with a lovely, layered keyboard progression before adding a slightly sloppy, yet fun beat and spirals toward a romping end. The weirdness isn't done there, though, and "6161" starts out with an almost indie guitar riff before building up with more silly keyboards and samples. By the time the epic house skewer album closer of "Carbon Cones" is flying off the rails, you wish the 45 minute album was actually longer. As mentioned above, Jacobs has no qualms with throwing just about anything into the mix, whether it's sounds from an antiquated rinky-dink keyboard or samples of him humming the harmony alongside a stuttering electronic bit. An album that's too lo-fi for electronic purists, and too cheesy for lo-fi purists, it's nonetheless a buttload of fun. Whenever his new release comes out, I'll be sure to seek it out right away.